Project QUEST, the nonprofit workforce development organization created more than a quarter-century ago by the COPS/Metro Alliance, has been awarded a $1 million grant that the organization says will allow it to serve more San Antonians with expanded job training programs. One of nine workforce development programs evaluated under the Pathways for Advancing Careers and Education (PACE), the Valley Initiative for Development and Advancement (VIDA) was selected as one of the most effective programs as measured by retention, graduation and employment. Findings from the study were revealed at South Texas College's Pecan Campus and celebrated by Senator Juan 'Chuy' Hinojosa and leaders from VIDA and Valley Interfaith. The study was a blind study -- essentially comparing what happened to 500 students who enrolled in VIDA and 500 students who enrolled in other programs. 250 leaders with Valley Interfaith assembled at Holy Family Church in Edinburg to challenge candidates for Hidalgo County Judge to commit to working with them on health, job training and colonia infrastructure. Specifically, leaders challenged candidates to commit to raising the income eligibility to qualify for the County's indigent health care program, to restore funding for long-term job training program VIDA and to install necessary lighting, streets and drainage in surrounding unincorporated neighborhoods. Months after 750 COPS / Metro leaders challenged candidates for San Antonio City Council and the Bexar County Commissioners' Court to support their living wage agenda in a nonpartisan accountability assembly -- and then delivered 8,555 voters to the polls in support of their agenda -- both Bexar County and the City of San Antonio increased entry wages to $14.25 per hour. 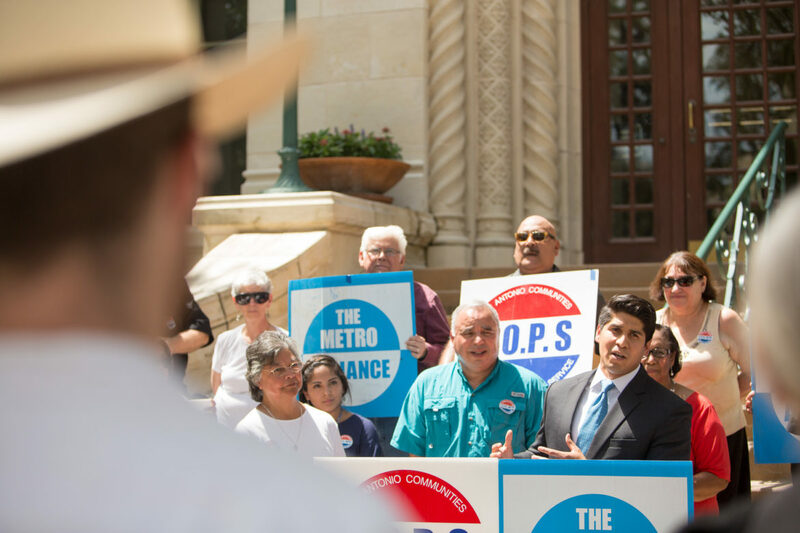 One week before the San Antonio City Council votes on the municipal budget, COPS / Metro leaders descended on City Hall to call for increased funding for long-term workforce development program Project Quest. Increasing the city's investment in Quest from $2.2 Million to $ 2.5 Million would enable the program to train an additional 100 residents for new jobs. One year after raising the minimum wage for employees of the City of San Antonio (from $11.47 to $13 per hour), COPS / Metro Alliance leaders are celebrating again after the City Council passed a budget that includes a second wage raise to $13.75 per hour. This follows an intense two-year campaign with over 1,000 leaders recently assembling with the Mayor and council representatives to remind them of their commitment to a living wage. When the Mayor made some noise about living wages being an 'outsider's' agenda, leader Maria Tijerina fired back with an editorial reminding her that COPS / Metro is a local organization with a robust constituency. City Council additionally approved shifting funding for workforce development program Project QUEST out from human services into economic development with its own line in the budget. Funding increased to $2.2 million including $200 thousand to cover tuition for the Open Cloud Academy training developed in collaboration with Rackspace. After a campaign that included educating County Supervisors about the economic (and life) impact of JobPath workforce development program, leaders of Pima County Interfaith won a 18% increase in funding for the program, from $423 thousand to $500 thousand. Pima County Board of Supervisors voted 4-1 for the increase after Pastor Steve Springer of Dove of Peace Lutheran Church and Lindsay Leonard, a JobPath graduate, spoke. Former students like Patty Popp credit JobPath for helping them bridge the gap between minimum wage work and a living wage career. After training for an associate's degree in radiologic technology, she kept on advancing to her current position as Director of Clinical Operations at Radiology Limited. Her story can be read in the first article below. During a house meeting campaign in member congregations, AMOS organizers encountered countless workers, many of them Black, struggling to find decent work. In response, members of AMOS created Project IOWA to simultaneously fix the "skills gap" in the labor market and train people into living wage work. The Des Moines Register reports that since its inception, Project IOWA has graduated 205 people, 40% of which are Black, and making on average $14 / hour. White House Declares ARRIBA El Paso "Bright Spot"
Due to its work in closing the achievement gap for Latinos in college access and STEM education, Project ARRIBA (established by EPISO and Border Interfaith) was named one of three El Paso "Bright Spots" by the White House Initiative on Education Excellence for Hispanics. Since its inception, ARRIBA has graduated and placed over 1,100 students in the El Paso economy.